This is the kind of book that I just love! Lots of little motifs or elements, as Thomasin Alyxander calls them, endless possibilities for combining and recombining into lovely jewelry! 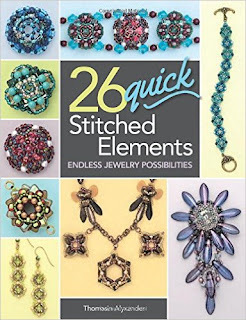 26 Quick Stitched Elements is published by Kalmbach, so you know you will get the well-illustrated basics in the back, and the easy to follow instructions and illustrations throughout the whole book. Alyx wants you to be able to take her elements and use them as in all sorts of projects, so she shows many different colorways, variations in details, and suggested uses for each one. 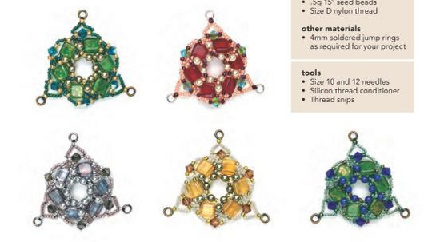 The book focuses on shaped beads, and on integrating them with seed beads, rounds, and bicone crystals. There are lots of rounded elements included, which can be used in so many ways: as earrings, bracelet pieces, charms, pendants, part of a more complicated necklace, etc. There are complicated-looking jewelry projects included, but after you've read through the elements portion, you'll see how straight-forward it is to combine elements into these more complex designs. Be aware, though, that only one brand of Czech shaped beads is used throughout, and that is the Czech-Mate system of beads. Other brands of Czech beads or Japanese shaped beads are not recommended because the hole spacing and exact shape may differ, causing bead counts to be unreliable. If you are an experienced stitcher, you can probably make the adjustments yourself, but it may be frustrating for less experienced bead workers.